Many of us are aware that our local communities are not as close as they once were. We grew up with stories of the post-war Blitz spirit of active communities in inner-city rural areas helping each other out with food schemes, education and rebuilding programmes. We have emphasized though the pages on this website the growing crisis facing the world posed by climate change. It is never easy to translate that global problem to the local level, and to find solutions that everyone can personally participate in to contribute to combating and reversing, or at the very least, slowing the pace of the problem down. As we have shown here, recycling the materials we use constantly in our lives; paper, plastic, metal etc, goes a long way to limiting the waste we put into landfill. This impacts directly upon our use of the world's resources by reducing the amount of trees we need to grow to pulp into paper, and reduces the need to quarry and mine for metal. As well as the use of the actual resources these 2 actions involve, the energy use and pollution output is huge, and has a negative environmental impact. So making sure our daily paper is recycled into next month's paper, and the glass bottles we use are made into more bottles further down the line, these are positive steps that will have an impact upon the environment and ourselves, and future generations, eventually. Community Initiatives – What can we do? First of all, identify a community group. This could be a school, or a class or year group within a school, or a church or faith-based group, or a street, a couple of neighbours, work colleagues, or a whole village! Many existing groups, such as gardeners, or a political party, or a mothers and toddlers group to give just 3 examples, might well be open to incorporating a recycling element to their main purpose for meeting. In the same way, try to encourage your local pub and local shops and businesses to include a recycling bin, and information about recycling locally, on their premises. It may even bring them extra business! In many towns and Cities throughout the UK there are community composting bins, where the members of a group deposit bio-degradable waste. Redhall Gardens in Edinburgh is one such example, the East London Community Recycling Project (ELCRP) on the Nightingale estate in the London borough of Hackney is another. Both projects were initiated by members of the local community, to benefit the local community. Both projects are thriving after several years, and they also produce a viable, sellable, commercial product, with many side benefits too. Weekly paper collection by local scout groups is a common sight in many rural areas across the country. The bulk collected paper is bought by local paper manufacturers/re-processors, which gives the group valuable income, and the householder is saved a trip to their nearest paper recycling bin. These few examples show the benefits of the recycling actions involved. Get out into your community and see how you can all make the difference. It is possible to get healthy, make new friends, and maybe create a new business opportunity or community income through a local recycling initiative. You will certainly be helping the environment and educating those around you by doing so. 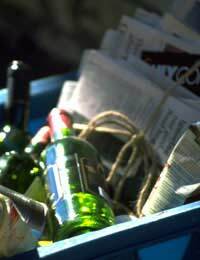 Be creative, get your community recycling!